We woke up at 430 this morning and one of our trail angels, Jim, treated us to McDonalds before setting out on the trail. I knew Cheryl Strayed didn’t hike the entire trail, but I didn’t realize that she started from mile 566.4, where we started this morning. I thought she started in Campo. So, as we started our journey this morning, I thought of her. I didn’t read the book, and I only watched part of the movie, so I don’t know her entire story. 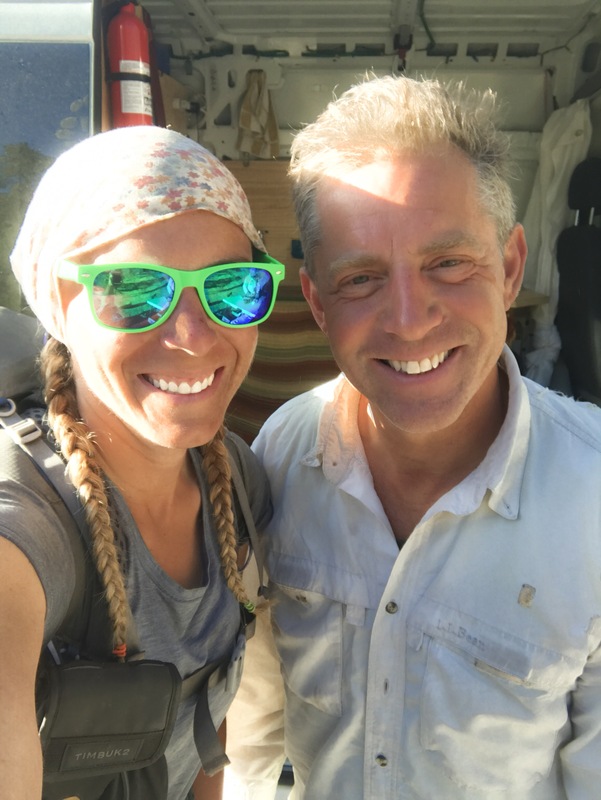 There has been controversy over her becoming “famous” for hiking the PCT, even though she didn’t hike the entire thing. 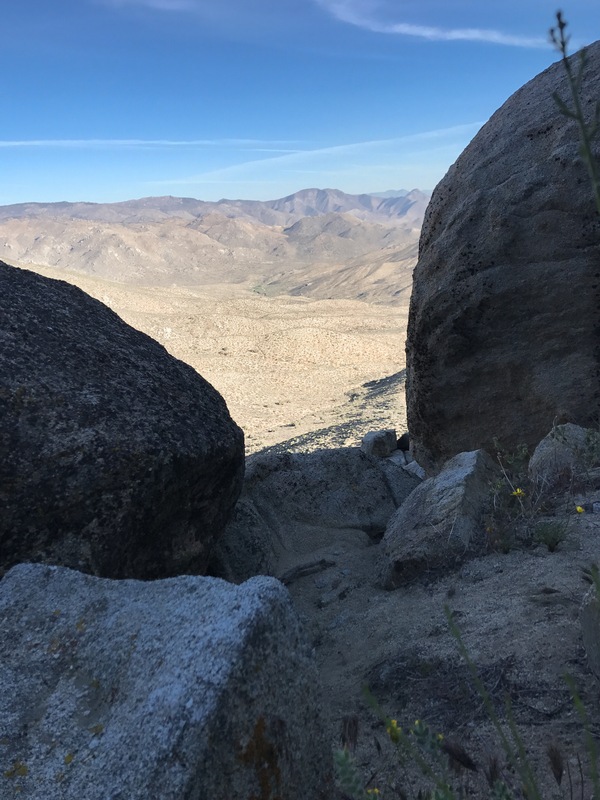 Whether she hiked the entire trail, or not; whether she became famous or not, does not negate the fact that she sure was brave to do what she did. She didn’t have any experience, had never put up a tent, had never backpacked and she started where we did on this morning. As I walked the path that she once walked, I wondered what she was thinking. If she was scared, or just didn’t care, because she was at such a low point in her life. 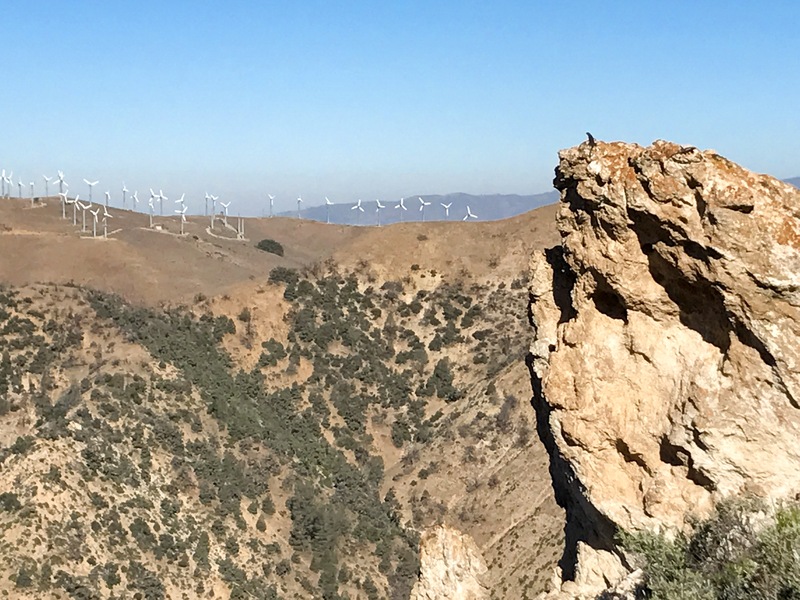 Although the movie didn’t inspire me to hike the trail, when I watched it, I thought, “if she can do this with no experience, then I sure as heck can do it”. Here I am, almost 600 miles in, staying strong and still eager to hike every day. can you see the lizard on the rock in the photo? Ha! 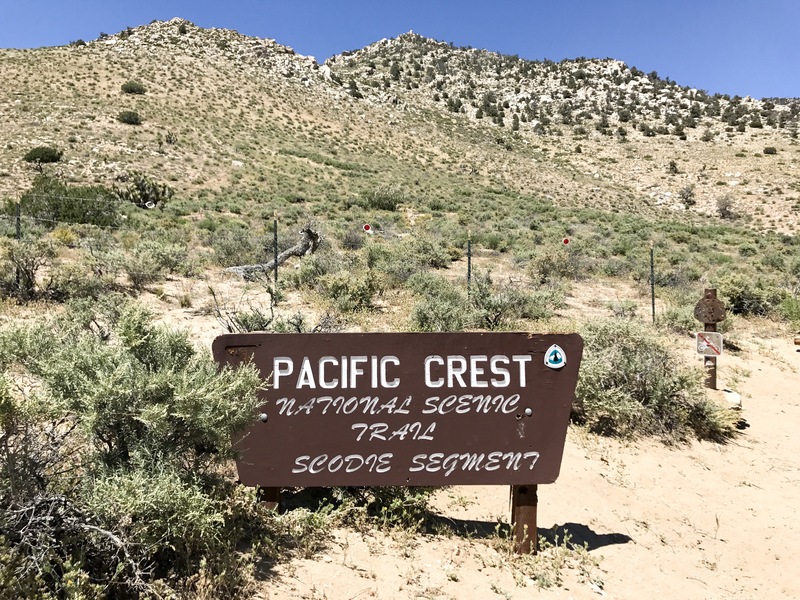 The hike from mile 566.4 was a bit of a 7 mile climb… not surprising at this point! 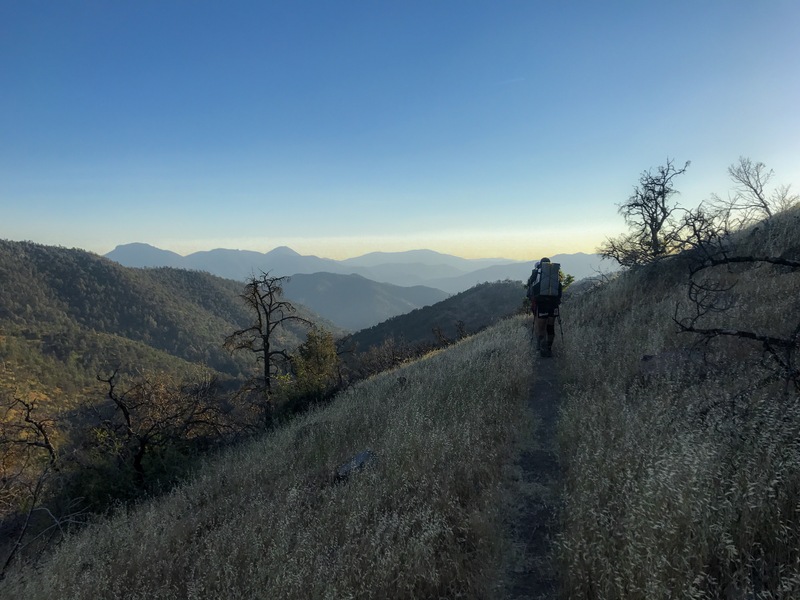 Although the remainder of the day, wasn’t as continuous of a climb, we ended up with around 5,000 feet of elevation gain today. So, with 7 days of food, 4 liters of water at times, it was a bit exhausting. Why 4 liters of water? Well, we’ve had several 16-20 mile waterless sections over the last several days. This was one of those days. 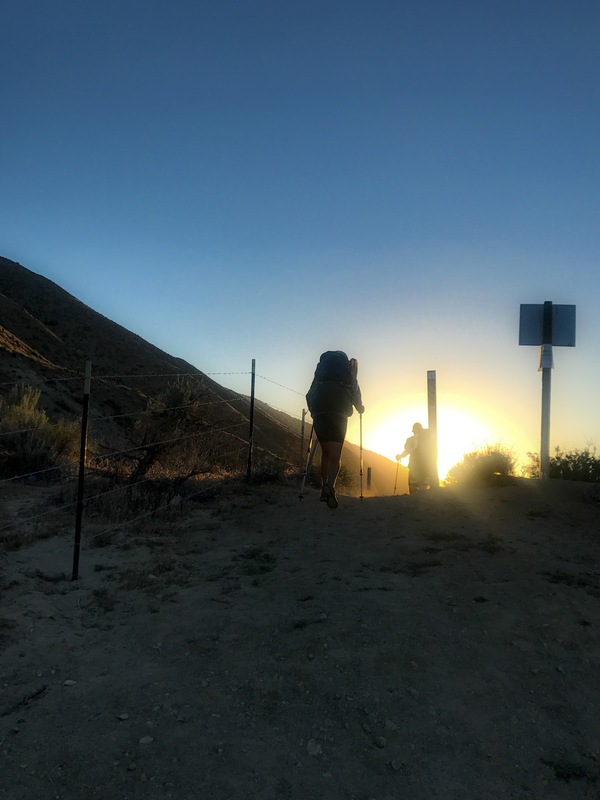 The thing I love about the trail the most, is that the scenery you start a day with, can be completely different, than the scenery you end the day with. One day you can be in the desert, the next, summit a snow covered mountain. On this day, the scenery changed quite often. There was more green throughout the day. Rock formations decorated some of the hills that we climbed. The wind turbines continued… all day. Don’t get me wrong, they are awesome, but I’m kind of sick of seeing them! Something else though… I am pretty sure I got my first glimpse of the snow covered Sierra Nevada, which was gorgeous, but also scary at the same time. With this year being the most snow the Sierra Nevada has ever received, I’m very scared. Not only am I scared of the danger that lies ahead, I’m also scared of defeat. What if it is impassable this year? What if I have to quit? I suppose I will cross this bridge if I come to it! The weather was quite hot. We had a 17 mile trek without water. When we arrived at the water source around 1pm, we all decided to take the afternoon off, nap, eat dinner and hike through the sunset. We had a 19 mile waterless stretch ahead of us, so we needed to hike at a cooler time of day, to prevent dehydration. Despite the cooler temperatures, we climbed a lot after our siesta, and I still drank a lot of water. A cool, perfect weather night, followed the hot day though. I was super excited for an amazing night’s sleep. Some people only look out for themselves. I suppose on the trail, that is the way that you should be… survival of the fittest, but no matter how hard I try, I can’t be like that. I came out here to learn to care for myself more, and stop worrying about other people, but I simply can’t. I empathize too much. Some see it as a gift, I see it as quite the opposite. I care about the hundreds of ants that I step on, despite trying to avoid them. I care about the little mouse that was shivering on the aqueduct. I care about the gal who is alone and gets lost really easily, that other people laugh at. I care about the guy who people make fun of for being different. Aren’t we all a little different/crazy to be walking 2,650 miles? I care about the guy who annoys the crap out of me, that other people use for resources because he is such a nice guy. And then I think that i am the girl who gives so much to others and people use me as well. Especially those who only look out for themselves. I suppose the biggest thing this trail has taught me, is to stand up for myself and what I want. It has also taught me that because of all the above stated reasons, I am happier hiking alone. Although I enjoy other people’s company in the evening at camp, I am much more at ease, hiking alone, at my own pace, on my own schedule. On the other hand, if I could learn to not worry about others so much, I might possibly enjoy hiking with others. Maybe that’s what I really need to work on. This was a very hot day. 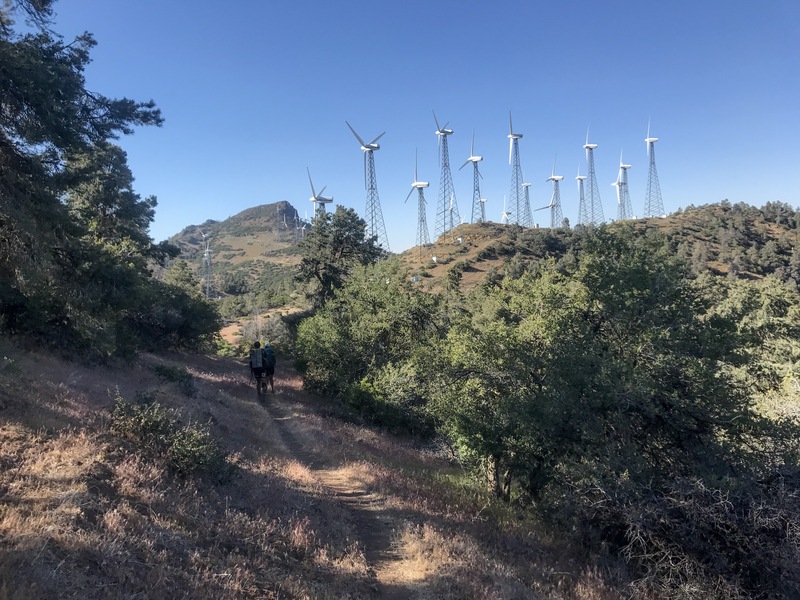 Thankfully, at least 50% of the trek was shaded by trees with the new terrain. 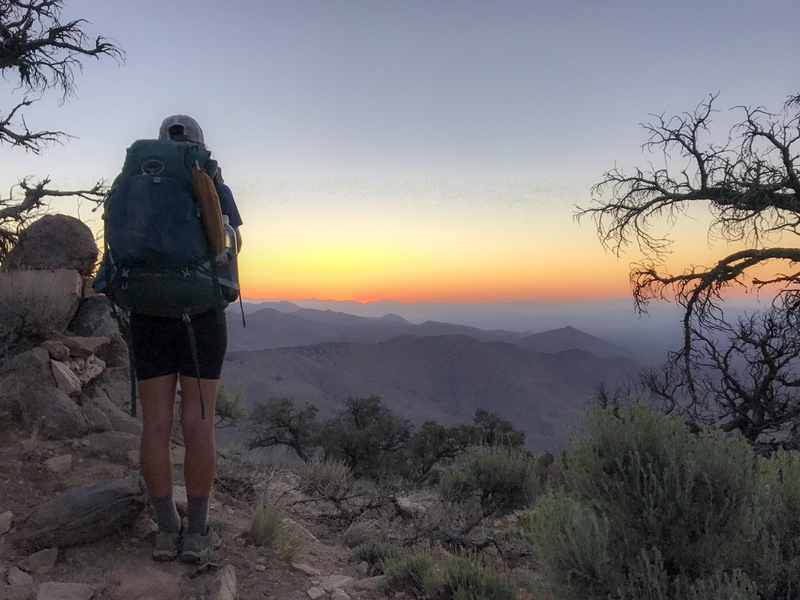 Shortly after the 600 mile marker, colors besides brown and desert tan, started to renturn into the scenery surrounding us. 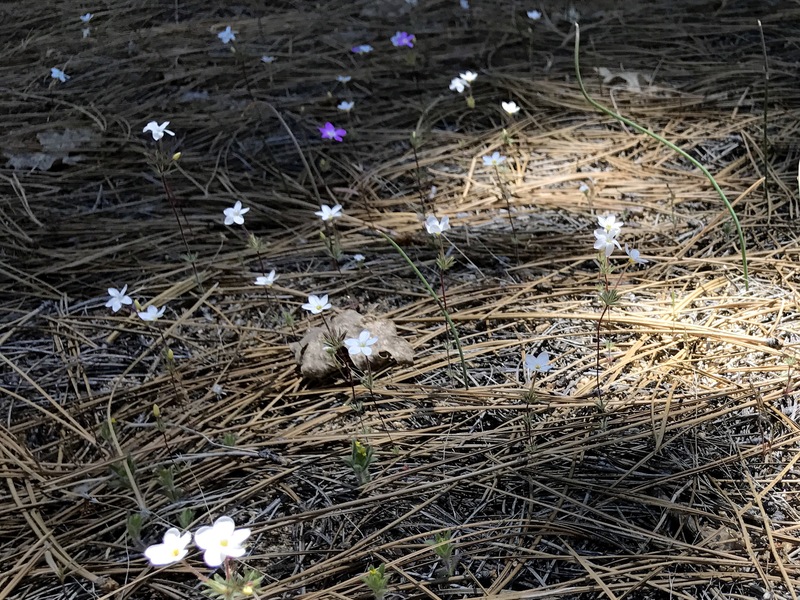 Pink, white and purple micro flowers covered parts of the desert forest ground. The ginormous boulders previously seen several weeks ago, returned with the trees. Water sources became more plentiful halfway through the day. Excitement filled my heart, as I knew the desert section was coming to an end. Some of my friends I am hiking with, had some friends in the area, who brought us major trail magic at Leaders Meadow Camp. They brought beer, wine, ice cream, and made us all a hot dinner (sausages, potatoes, asparagus, salad). It was sooo awesome. I have now somehow managed to get 4 holes in the mesh of my tent. So, if you spot a tent with 4 little pink KT tape hearts scattered about, that’s me and my handy tent repairing skills! I slept for a few hours. As I lay in my tent, I looked up at the clear sky through the trees. The tress that surrounded my tent, almost formed a circle around my tent. Their trunks skinny and bare, branches with pine needles only forming 3/4th of the way up their trunk. The stars were visible in the gaps between trees and branches. The last thought before my happy belly and mind drifted off to sleep was of how screwed I would be if one of these trees fell on me. Thankfully, they didn’t. The heat of the day prior, convinced me to do a night hike on day 36. This was the start of my favorite week so far. I set my alarm for 120 am and started hiking by 2 am. 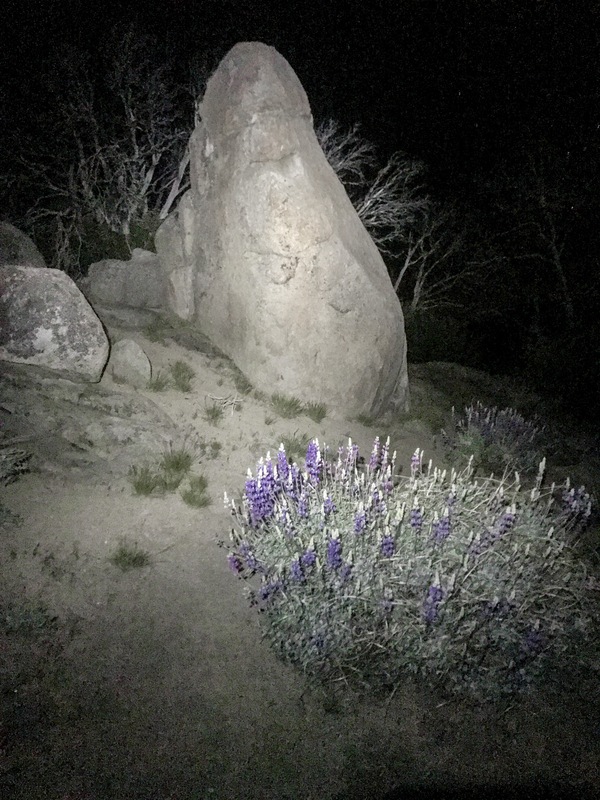 Night hiking sure is a completely different experience. I was initially distracted several times by the brightness and visibility of the Milky Way. The noises in the night and my mind playing tricks on me, soon took my attention from the stars. My body’s aches and pains soon distracted me from what was in the darkness, that could potentially eat me. 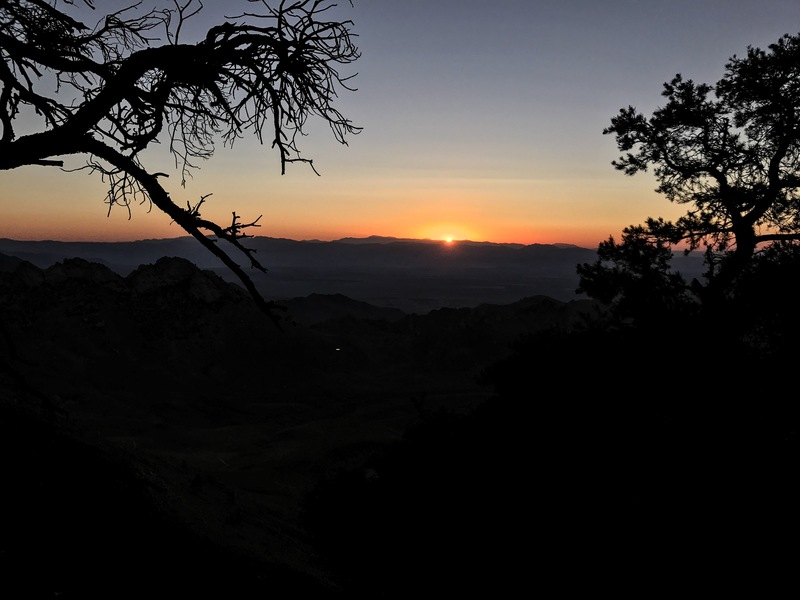 A few short hours and several miles later, the sunrise distracted me from the pain. 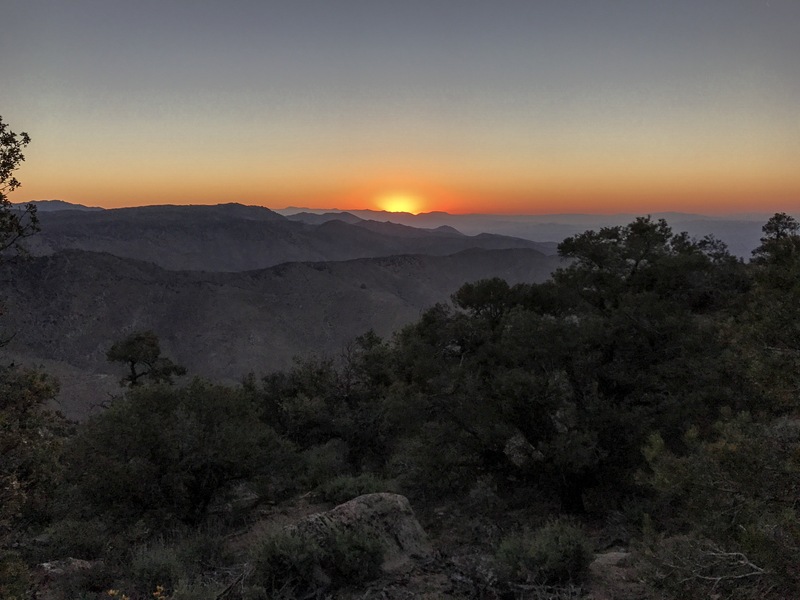 The sunrise revealed the features of the desert had returned. The luxury of tree coverage was out of sight. The next reliable water sources was 30 miles away. It was a good day to night hike. Trail magic awaited at mile 616. 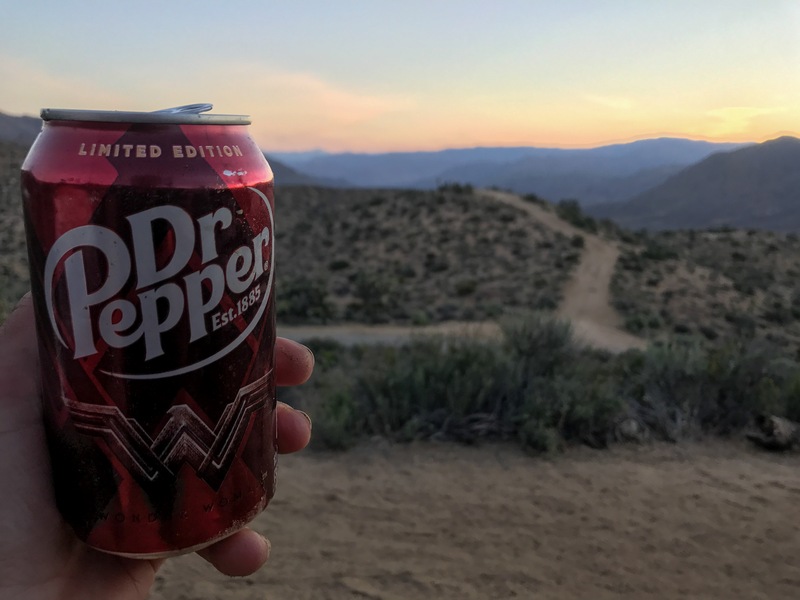 A refreshing Dr. Pepper, cold water and an orange. What a great way to start a new day! 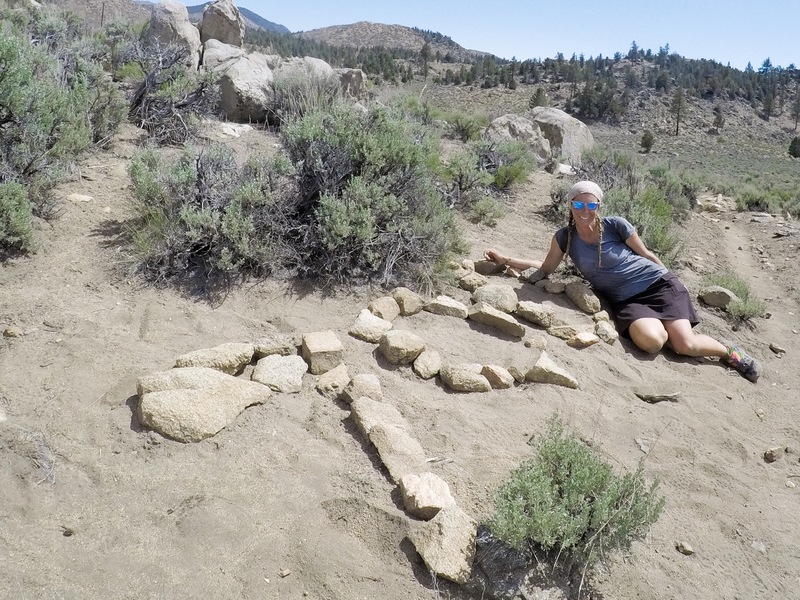 Thank you trail angels. 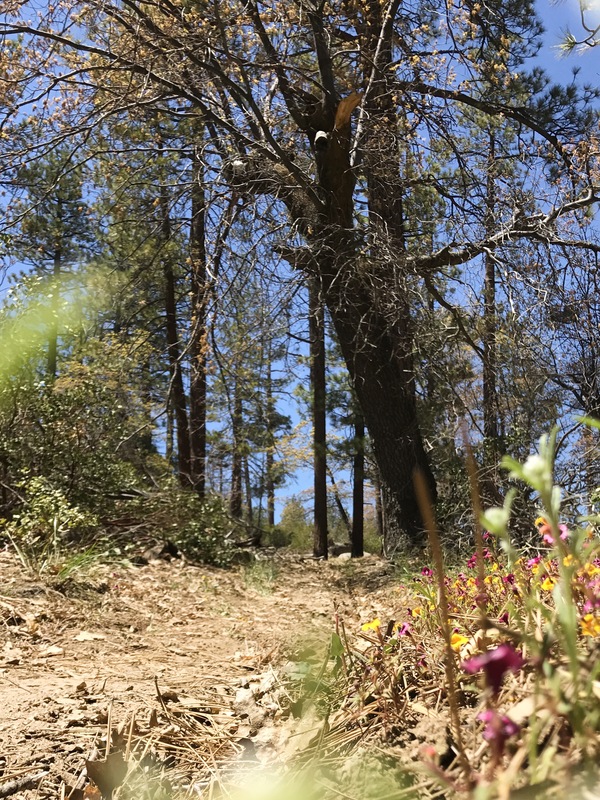 Although back in the desert, at least there were mountain views and wildflowers for parts of it, making it much more enjoyable. By 9am, it was too hot to hike. 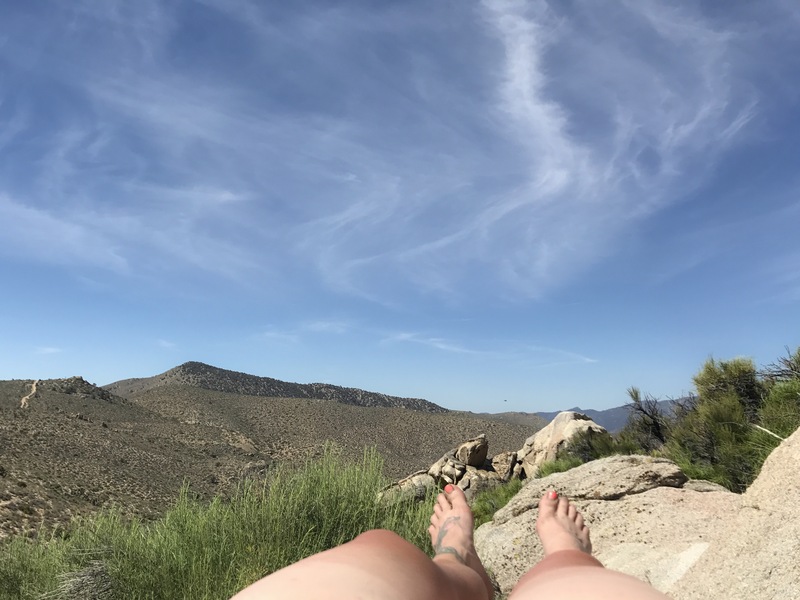 Having conquered 15 miles already, I decided to take a bit of a siesta while sunbathing (attempting to lessen the hiker tan lines). The siesta didn’t work out as planned. After a couple of hours, the sun became too hot to even sit in. No shade could be found. So, I just kept walking. 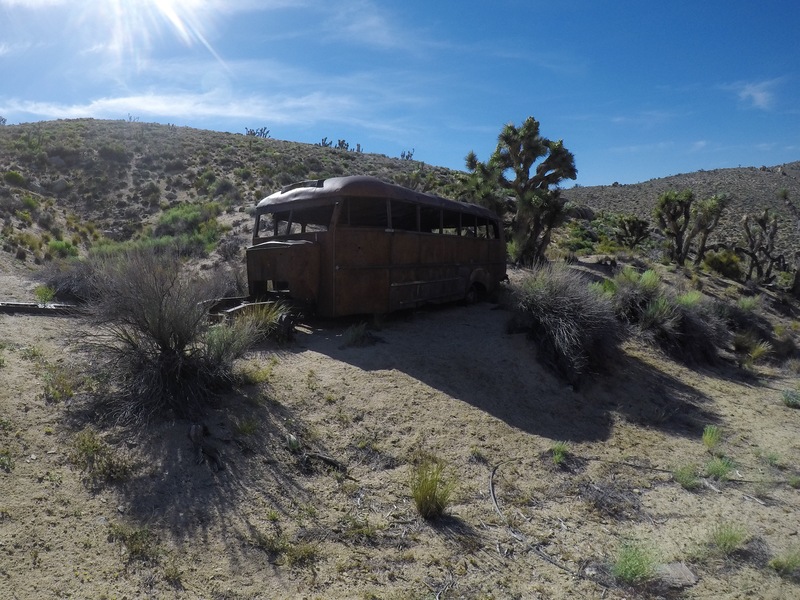 I walked for a few miles until I found a Joshua Tree to sit beneath to shade the sun. I only had 2.5 liters of water left and the next water source wasn’t for 17 miles. 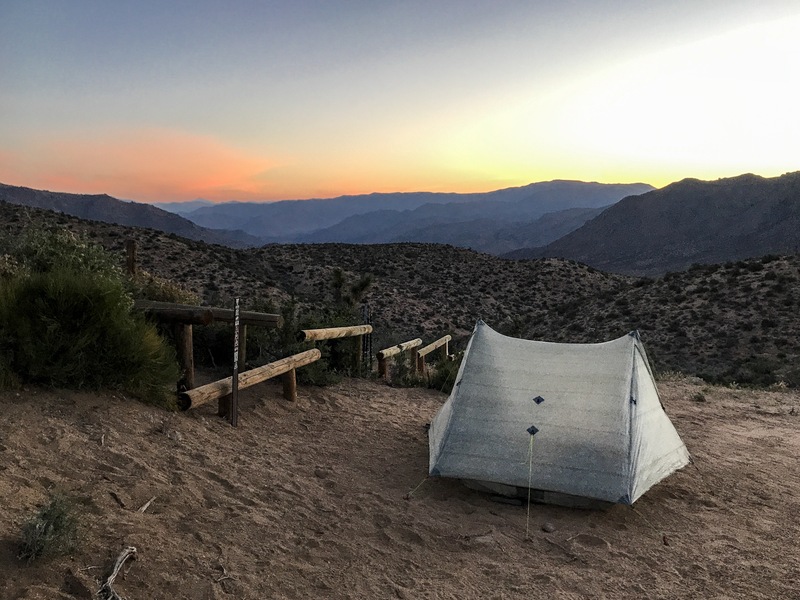 My plan was to get to the next camp site at mile 630.8, sleep until the sun went down and then continue to hike until the next water source, where I would spend the afternoon the following day. With this heat, there is no compromising hiking during the day. There is absolutely no shade and hiking at night is a necessity. This was the first day with this high of temperatures. 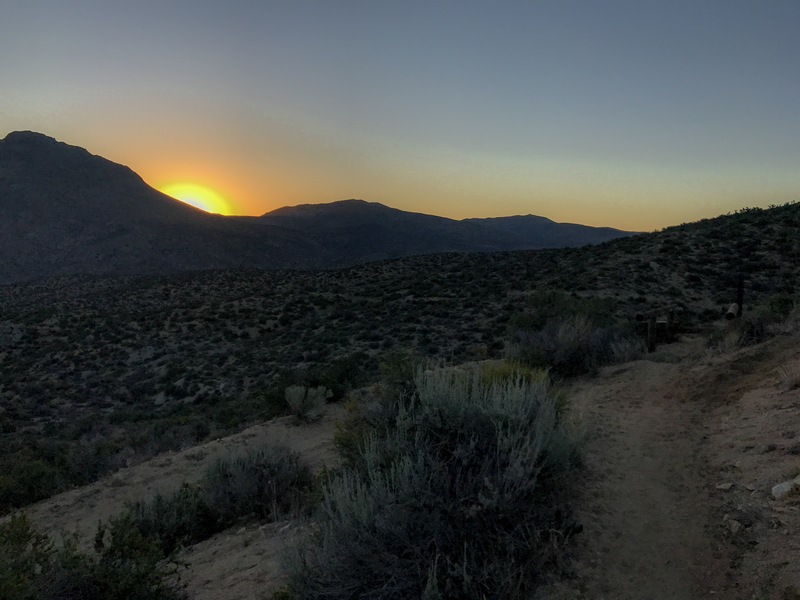 If you plan to hike this section later in the season, hike at night. The gallons of water at mile 630.8 probably saved my life. I don’t know what I would have done without it. A lot of people struggled on this very hot, waterless stretch. 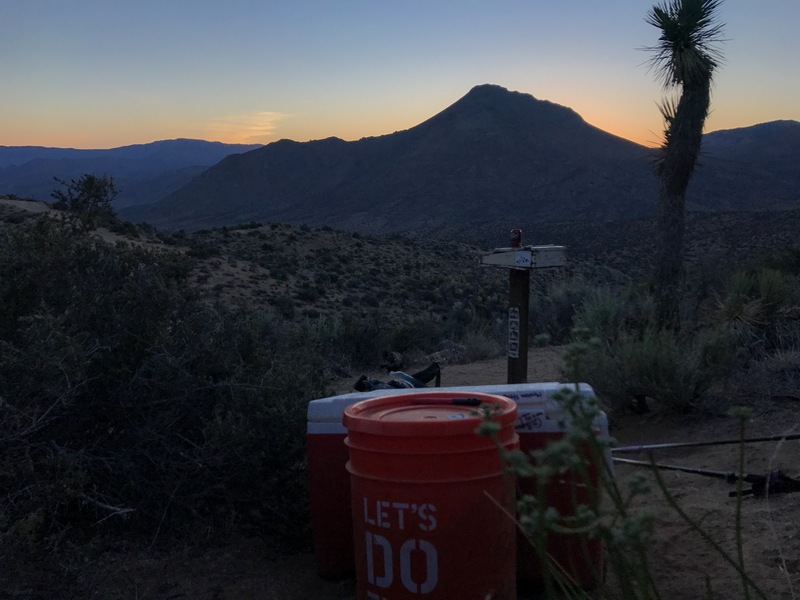 After hanging out at camp for awhile, I grabbed a couple liter water bottles, filled them up with water and walked back a couple miles on the trail to make sure everyone had enough water. 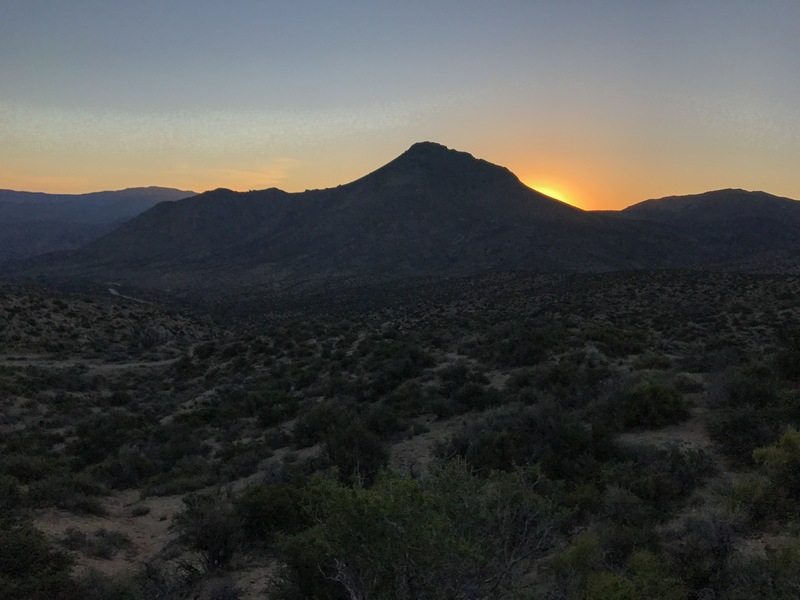 After we all arrived at camp, we enjoyed the beautiful desert sunrise. Problems I need to solve soon: my hip belt won’t tighten anymore because of the weight loss; I seemed to have misplaced several tent stakes in the wind storm; shoulder injury; sun blisters on nose and hands. We left at 415 am this morning. From the moment we left camp, we were climbing up hill. We reached the top, just as the sun was rising. Another beautiful sunrise. Definitely my favorite part of night/early morning hiking. We reached Mclver Spring and Cabin around 9 am and spent the day there, waiting for it to cool off. I dunked my head under the spring a couple of times. It was so refreshing. One of the many highlights of this day. After cleaning up, doing some ziplock bag laundry and eating lunch, I took a bit of a cat nap. 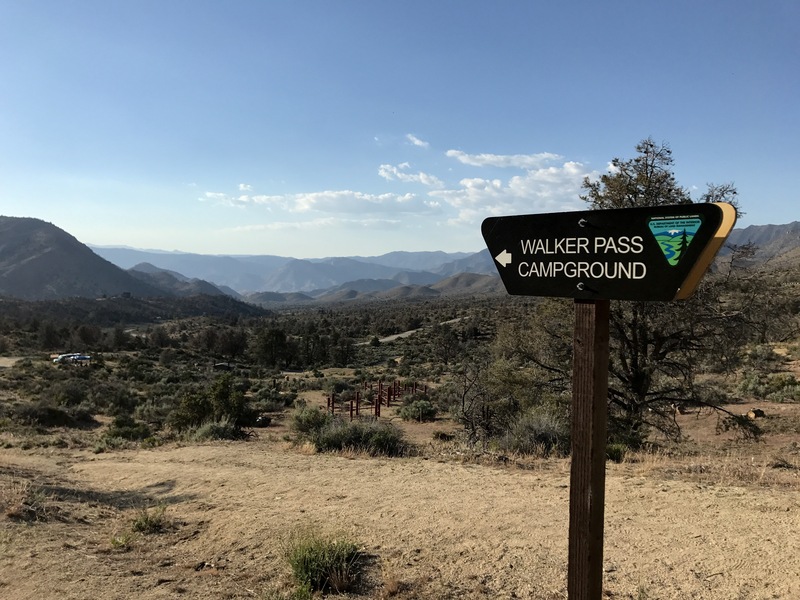 We ended up at Walker Pass Campground that evening. I was able to stay up for most of the sunset, but fell into a deep sleep, shortly after. Day 38 was one of my favorite days. 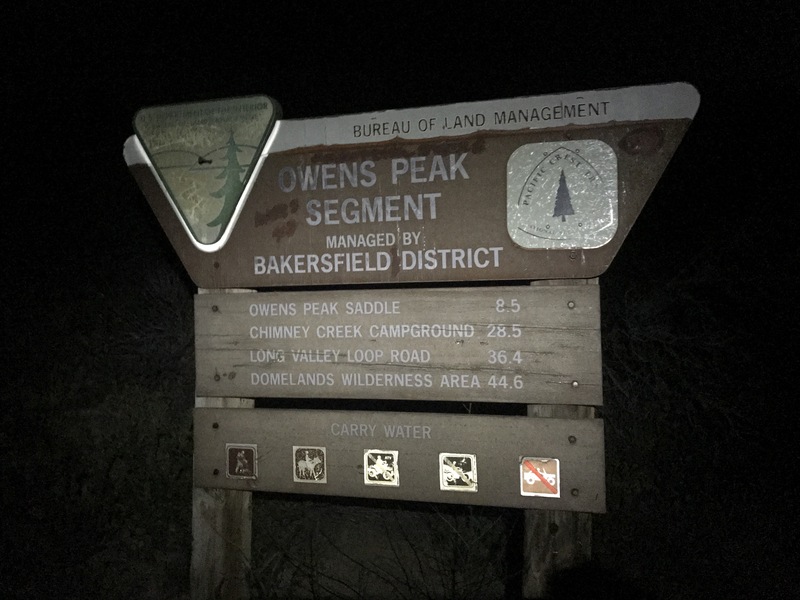 I started the day climbing Owens Peak, so I started at 3am. The heat during the day is quite miserable and I’ve become quite fond of night hiking. Although there was a ton of climbing today, I passed several people who mentioned trail magic by Chimney Creek, so after doing 20 miles by 10am, I decided to go 30 miles to get to trail magic. It seemed like the climbing never ended today. Although I got started super early, I was still climbing in the eat of the day. In fact, I didn’t get enough water for the last big climb, so that was a tough one. Despite all of the climbing, the views were so beautiful and it was one of my favorite days. I went at my own pace, as far as I wanted, took lots of pictures, and arrived just in time for trail magic. 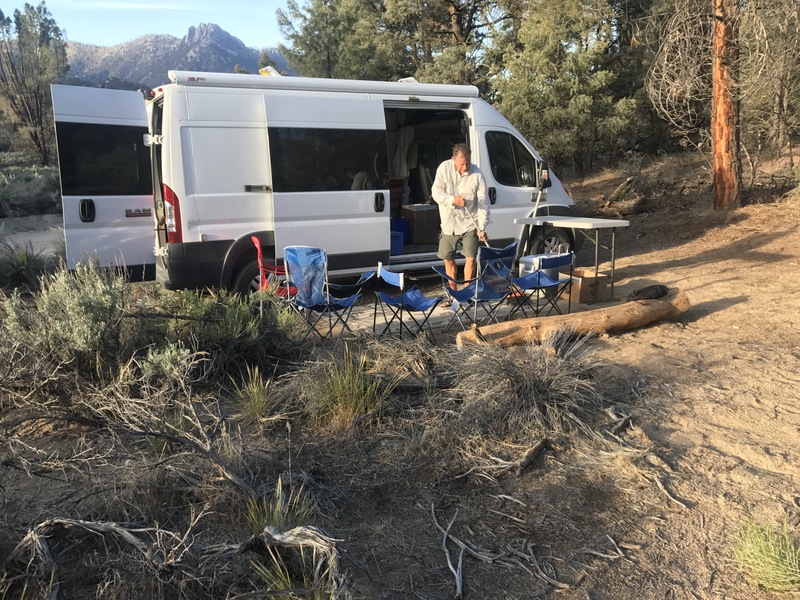 When I crossed Chimney Creek, I came to a white van with a nice camp stove set up, coolers, even a rug. Saunders was hanging out beers and had one root beer left, which I snagged. I told him that I did 30 miles to get to him. He had chili dogs, oranges, apples, and even had a vegetable curry option for vegetarians. 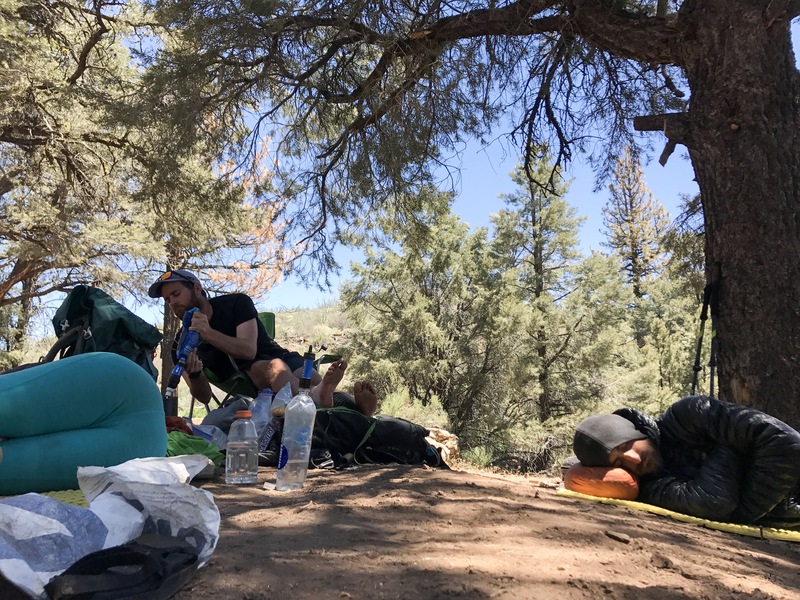 He had plenty of food for incoming hikers, so I managed to eat 4 chili dogs, an orange, an apple, and two glasses of wine… my first and probably last drink on the trail! I met a ton of new friends and we all stayed and had a great time at Saunder’s Place. Saunder is a pretty awesome fella. 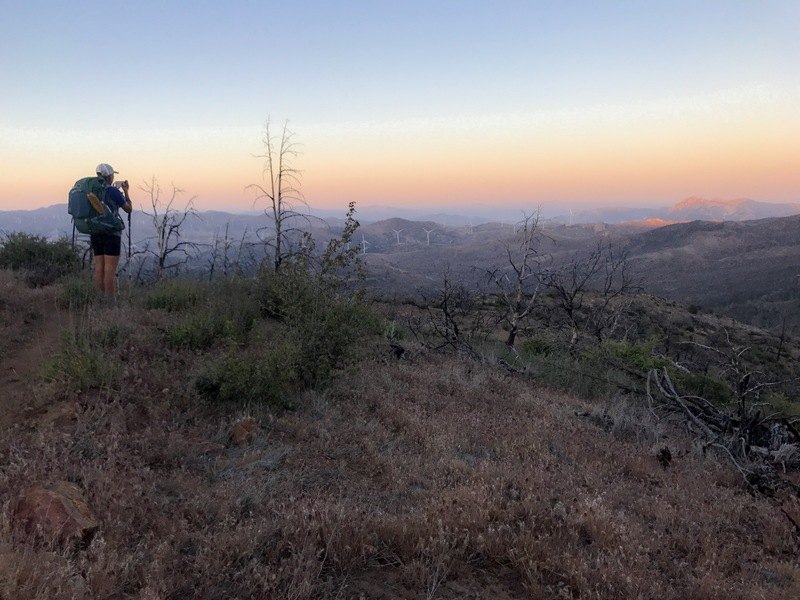 He hiked the PCT last year and started to hike again this year, but had to get off the trail due to an injury. So instead, he became a trail angel. He will continue to make his way north, stopping at popular areas along the trail. He made my day and will continue to make hikers smile along the trail. I am so grateful for him, as I am all trail angels. I camped with my new friends close to Saunder’s Place. There are many reasons this was my favorite day, and Saunders Place was one of them! 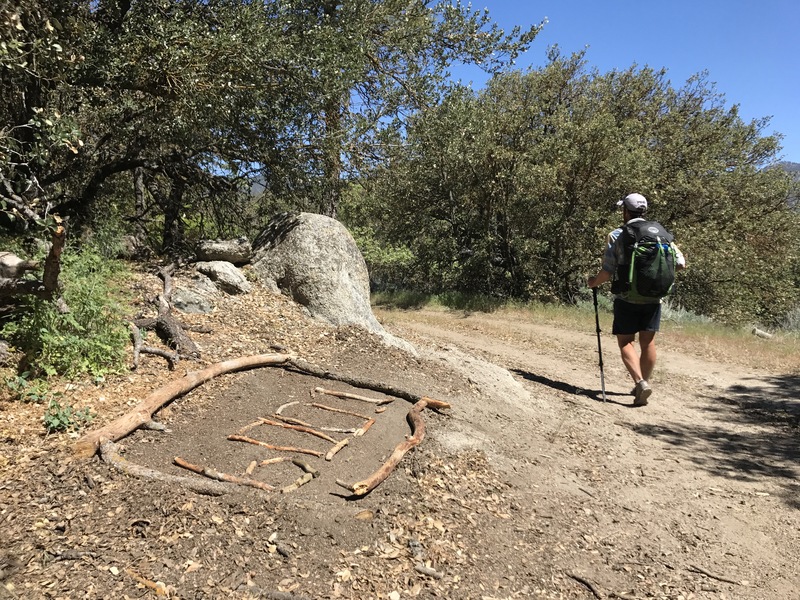 Making it to Kennedy Meadows a huge milestone for myself and most PCT hikers. 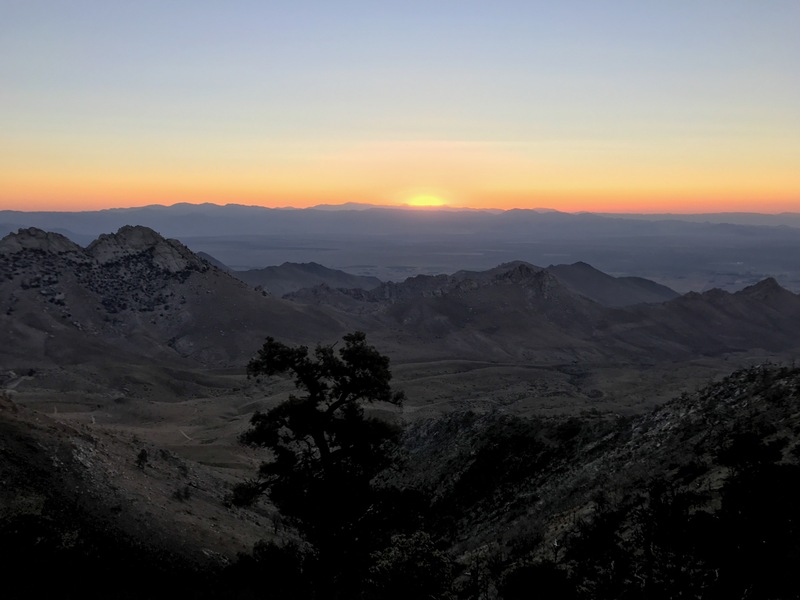 It officially marks the end of the desert and the start of the Sierra Nevada mountain range. 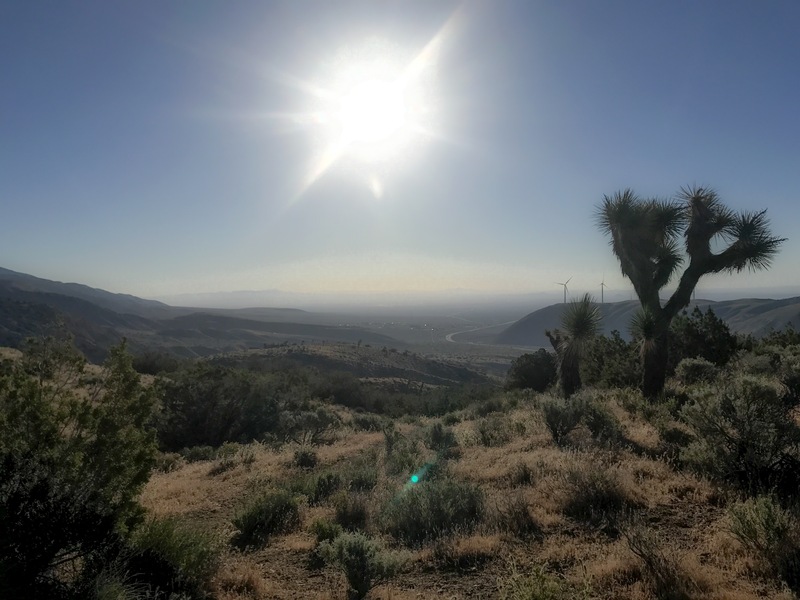 The desert has been challenging, as will each section, but I cannot say that I will miss the desert. I was actually planning on having an easy 17 mile day today, but once I have town within 5 miles of me, it’s hard for me to stop. The last several miles, were quite easy, so I decided to just go for it. Passing the 700 mile marker, was quite emotional for me. Not only have I surprised all of my friends and family members with my determination, strength and bravery, I have also surprised myself. I walked 702.2 miles through the “desert”! I kept walking through the snow storm. I kept waking through the 65 mph wind gusts. I kept walking through the heat. I kept walking up and down… and back up again. I kept walking with the blister on my toe and missing toe nails. I kept walking with sun blistered hands and a sun blistered nose. I kept walking with a hurt shoulder, exhausted muscles and tired mind. I just kept freaking walking, and I did it! Bring it on High Sierra! Will I survive the record breaking snow year? I guess you’ll have to read next week to find out! I always look forward to your posts, pictures, smile, and inspirational / talented writing. Keep it up as you are doing amazing! I also thought C Strayed started at Campo. Thanks for the 411. Anyway we followers love you and appreciate your posts, awesome pictures, and your tenacity. Well – At least I speak for myself – the lone wolf. Alas work calls. Safe hiking! You always make me smile!! Thank you for the constant boost and follow! Great progress! 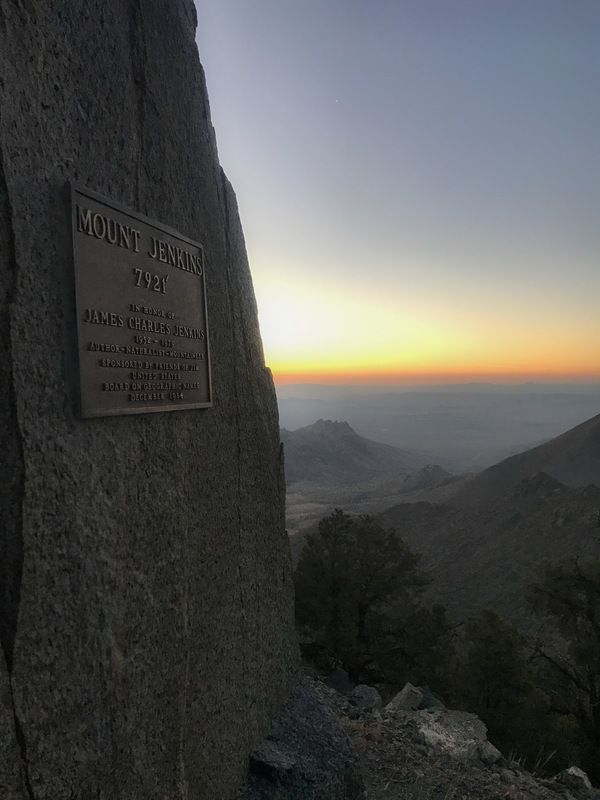 Thank you for sharing your thoughtful posts and photos of your PCT thru-hike. I hope the heavy snows and raging creeks in the Sierra’s do not impact your journey..be safe! Congratulations on making it to Kennedy Meadows! 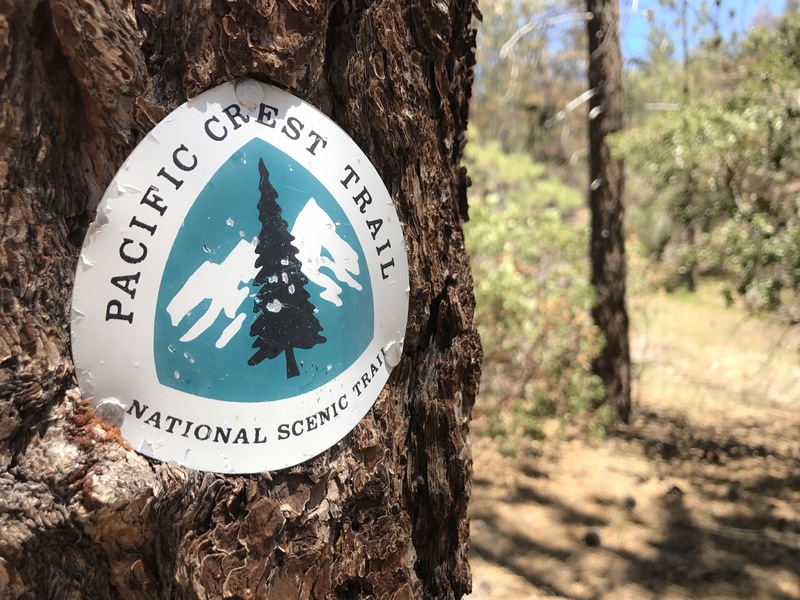 I have a handful of milestones on the PCT that mean something to me like the 100 mile mark, Oregon border, and Washington border, but none of them mean as much as Kennedy Meadows in my opinion. Based on the round of applause given when a hiker makes it there, I think most people feel the same way. 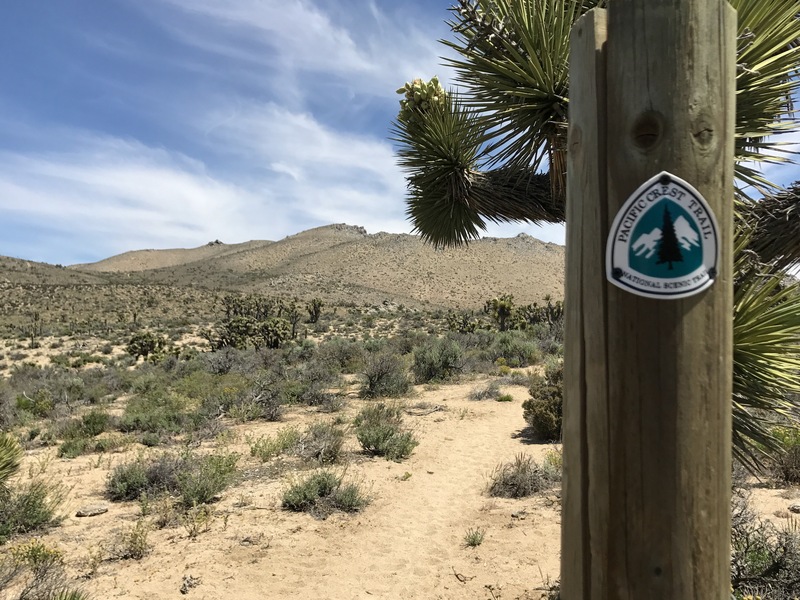 Good luck in the Sierras! It has been terrific following your journey through your posts and blog. Wondering how you have found the ArmaSkin have performed for you? Since you covered major distances without and then with ArmaSkin you’ve had a good opportunity to put them to the test. The vibes coming from your IG account suggest that you are or will be shortly breaking your hike because of the dreadful snow conditions ahead. From what I’ve read elsewhere a very wise decision. I promise I haven’t forgotten to respond to your email! I will do that this weekend! I am grateful for ArmaSkin and helping my feet out! I will send you an email tomorrow! I liked it that you said you liked hiking alone. Seems that is perfected by many. Abbey and Thoreau enjoyed solitude. Without getting to carried away, Abbey said: <> Seems like you have found that gift also. And I still looking forward to every new segment of your blog. I completely agree!! I love that quote. Thank you. I have been following you since you started your journey. I check every Friday for updates hoping that you have posted updates so that I will be able to sit and enjoy your latest writings. They are the true highlight of my week! I’m definitely pulling for you as you enter the Sierras. You should do fine if you can keep your focus and maintain those qualities in your hike. YOU are an inspiration! Keep it up! Awe thank you so much. That is so very sweet of you to say. I’m glad I could bring some entertainment to your week!! You made my day! This is AMAZING! I am so excited for you! Once again a well-written, interesting and inspiring blog. Absolutely love following your adventures and progress. Keep on keeping on. Gosh, I just started reading your post, and an captivated by your writing. I love reading trail journals and yours, well I have no words to describe how much I enjoy reading yours. And the pictures. 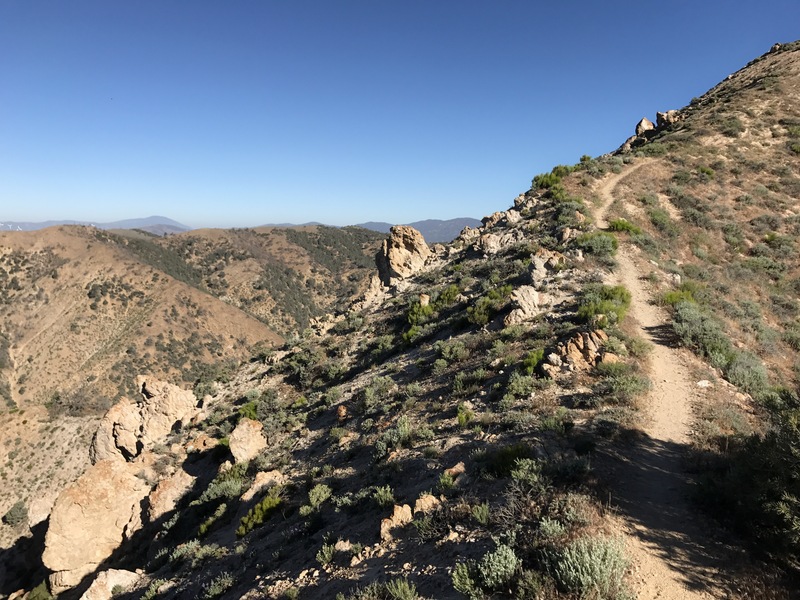 I love trail pictures, and how they (almost) put me on one of my past trail adventures. 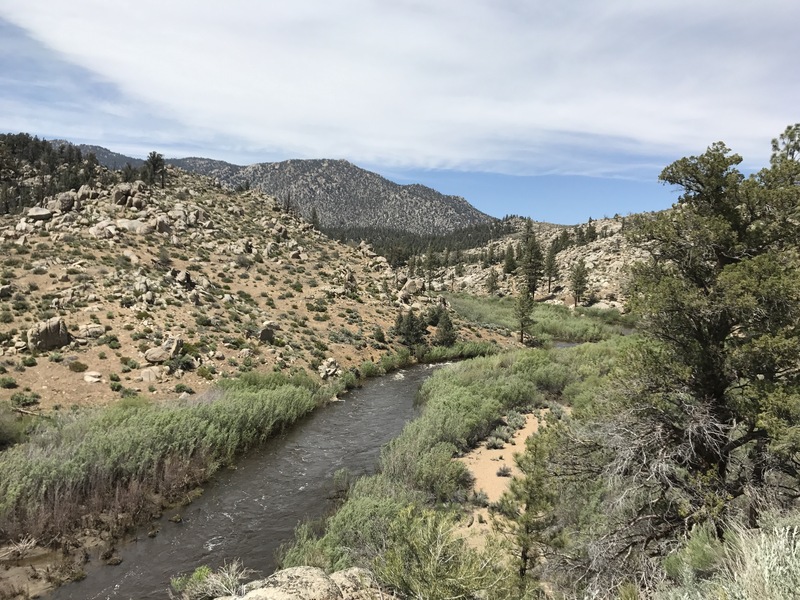 I remember a small trail I made, to a favorite fishing spot, long ago, that I began to love (the trail), even more than the fishing, and how it turned me into a hiker. Hiking is magical, and through your words, I feel the magic. I wish you the best. Wow! Thank you so much!! That is one of the nicest compliments I have received. I am really glad you enjoy reading my trail journal! Thank you for the nice words! Oh…….. I forgot, congratulations on making Kennedy Meadows. 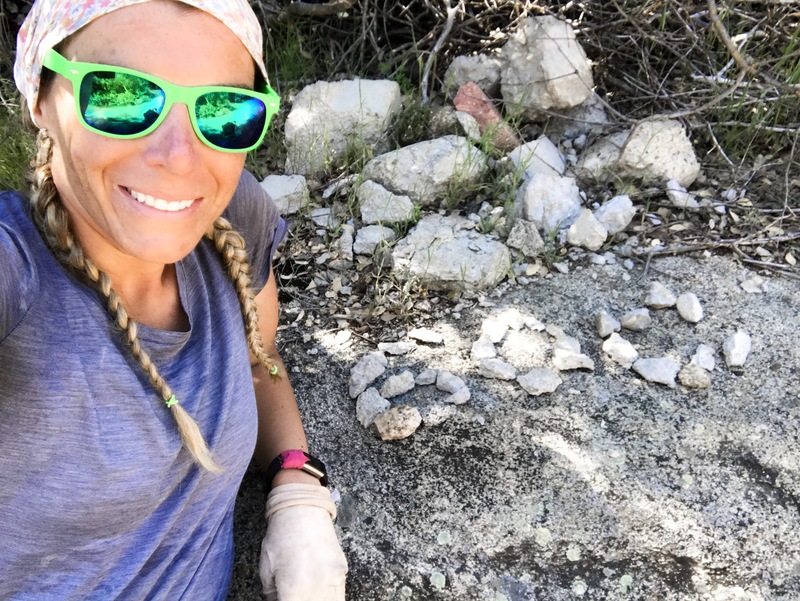 I was shocked to learn that Strayed had used heroin days before she started her hike in Mojave and she had not packed her “Monster ” bag or any of the things most people try to do prep. Even if they only try walking for a few miles everyday and getting their pack weight manageable. I guess that showed me that if you make up your mind and your determination is high (barring injury) a person CAN DO ANYTHING! !